I am really enjoying my homemade cheese and learning how to make it. I found this great website that starts you out making yogurt and then on to easy cheese all the through to the much more difficult cheeses to make: http://biology.clc.uc.edu/fankhauser/cheese/cheese_course/cheese_course.htm. Today I tried my hand at making labneh. Very easy and very delicious! It is apparently a Middle Eastern cheese that you serve with olive oil, mint and olives on pita chips. Stir the yogurt until is is good and smooth. Then add 1 tsp of salt and stir well. (If you are using my yogurt recipe for this just use the whole batch, if not it is about 1 quart of yogurt). Put a cheese cloth into a bowl and pour the salted yogurt on top of the cheese cloth. 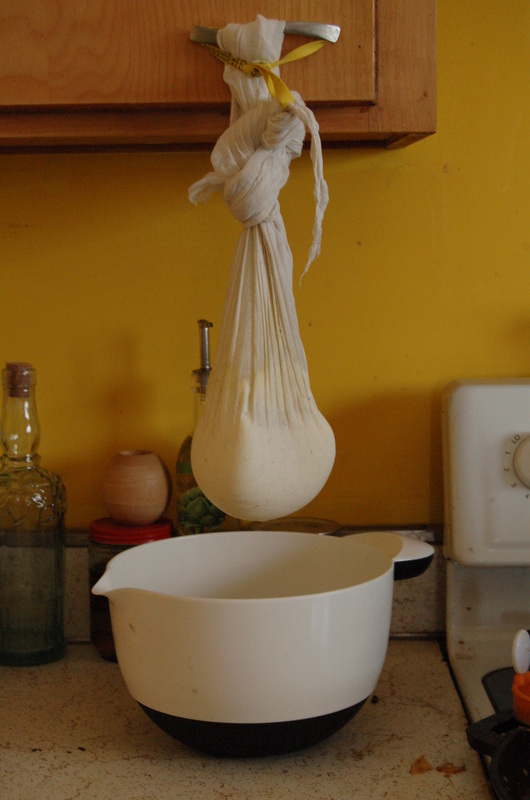 Take the four corners of the cheese cloth and bring them together and tie a knot to suspend it by. Suspend the cloth over the bowl to drain the remaining whey. Let it hang here for 24 hours. And here is the finished labneh, ready to eat! All the fun I am having with making fermented foods has lead me right to cheese. I wanted to start with something that was very simple, so that I couldn’t get it wrong. I found this recipe for lactic cheese on another blog and figured that it was the simplest cheese I could possibly make. First, heat your milk to 86 degrees F, add the starter and mix thoroughly. Add a teaspoon of the diluted rennet into the milk and mix in an up and down motion. (I somehow managed to mess this up and I added a teaspoon of rennet to the 1/3 cup of water. I used the whole 1/3 cup in the milk and I still got cheese.) 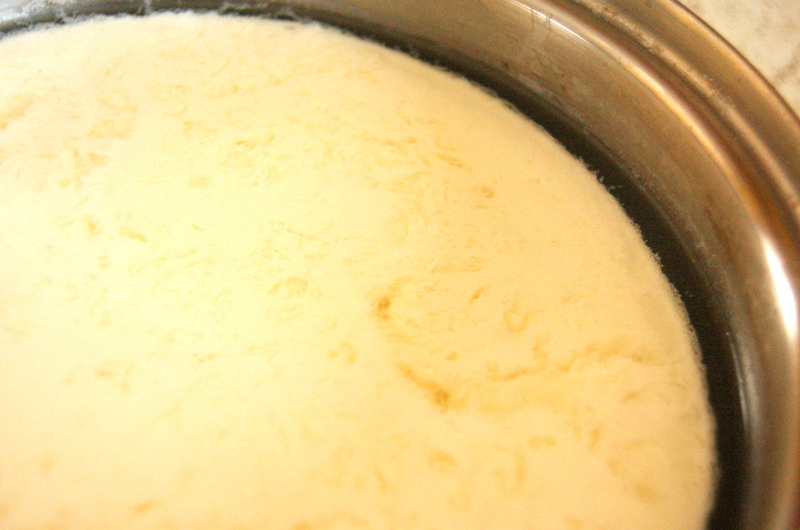 You will see the curd start to separate from the whey. After waiting patiently for 12 hours or so, you will have a solid curd. If the cheese sits around longer than the 12 hours, it will be just fine. Now you strain the curd from the whey. I put mine in some cheesecloth and let it sit overnight. When I woke up the next day, I had fresh cheese for my eggs. Keep in mind that this is supposed to be a soft cheese and it will be light and fluffy. 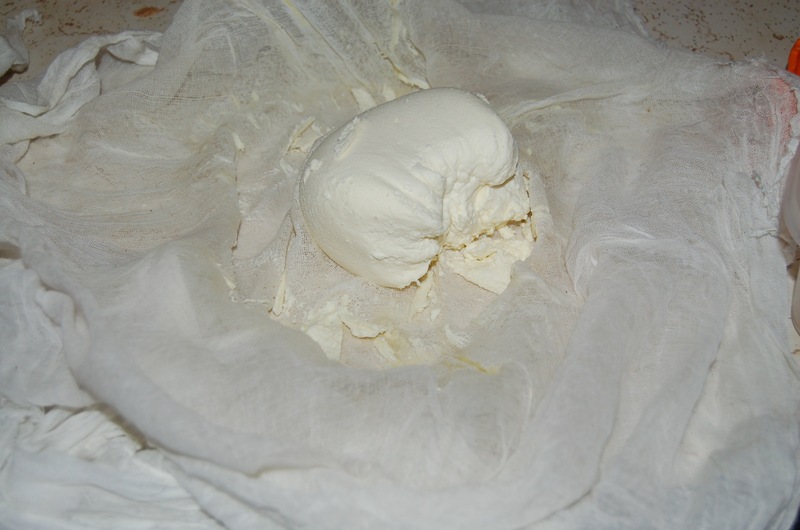 That is it, your very own homemade cheese! The next few steps are mostly all waiting. First you siphon the mead from the bucket into the carboy. You don’t need to get every last bit of the mead out because when you try to, you end up with extra silt in your mead. The layer on the bottom of the bucket is the dead yeast cells that were spent and sank to the bottom. The reason you siphon the wine rather than just dumping it is so that this layer stays where it is and the mead moves on silt free. If you stir up the layer in any way it will end up getting sucked into the siphon and brought along with your mead. 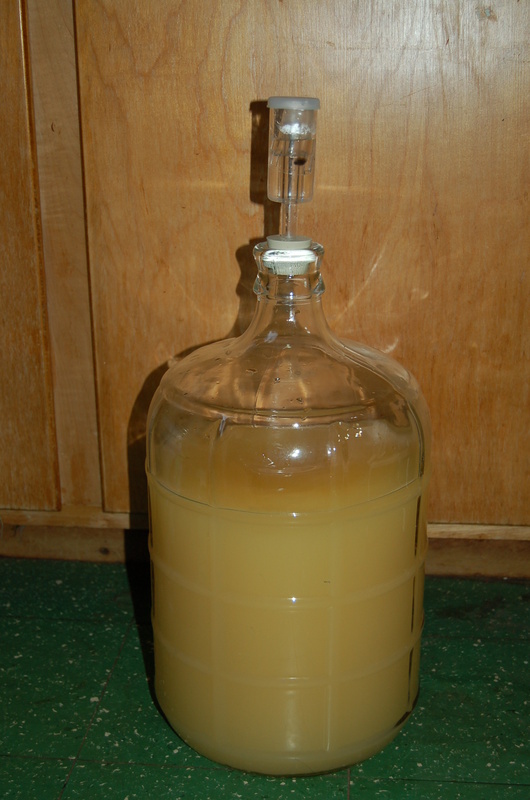 Once the silt free mead is all in the carboy, add enough water to fill the carboy about two inches from the opening. If you fill it too full, you will have a big mess, so leave room in the top! Finally, put the water lock in the opening and wait. For three to six months. Be patient, it is worth it. If you really want really clear mead, you can rack once during this time. That means to siphon the mead from one carboy to another, again leaving the silt behind. I have found this to be just extra work, and so I stopped doing this step. You can tell that the mead is done when the bubbling in the water lock has stopped. And now, finally, your mead is ready to bottle. I collected old wine bottles from friends and family and a local restaurant. I did have to buy the corks though. Just siphon the wine into the very clean bottles. I did not sterilize anything. They were making mead long ago when sterilization wasn’t around and it worked just fine, so why should I change things now? I put the corks in warm water to try to get a really good seal and then popped them on with my fancy corking device. Oh, don’t forget these super fancy labels I made. You should always label your mead as to what the heck it is. I made a couple small batches to try and forgot to label them. They are all mixed up and I don’t know what I’m getting all the time. If you look at the bottle on the left, you will notice some silt on the bottle. I stored them laying down and so this is where it settled. You are making things at home and so sometimes they can look funky like this. It is ok. It is still delicious! 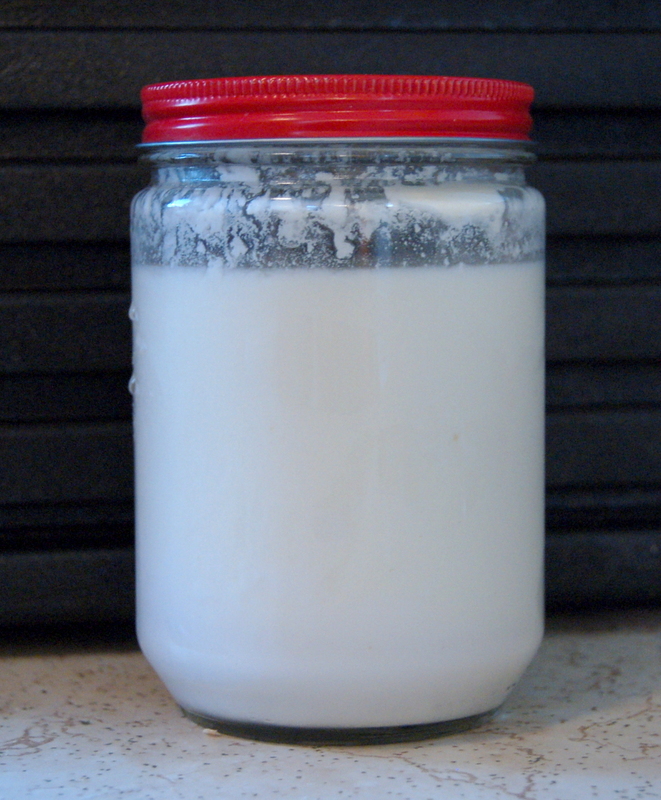 One of the byproducts of my yogurt making project is whey. Since the yogurt making went so well, I have lots of whey leftover. I hate to throw anything away, so if I can find a use for it, I will. The use I found for they whey is to make bread with it. I hadn’t planned on making all my own bread quite yet, but now I guess I have no other choice. I can’t just let all that good whey go down the drain! Warm up about 1/3 cup of the whey and mix in the yeast and a little of the sugar. Wait for this to get foamy. Mix all the dry ingredients in a large bowl and then add the yeast mixture along with the butter, egg and the rest of the whey. Mix until a dough forms. Knead the bread for about ten minutes, then cover and let rise for about 20 minutes. Punch down and let rise until it doubles in size. From here, I split the dough in half. 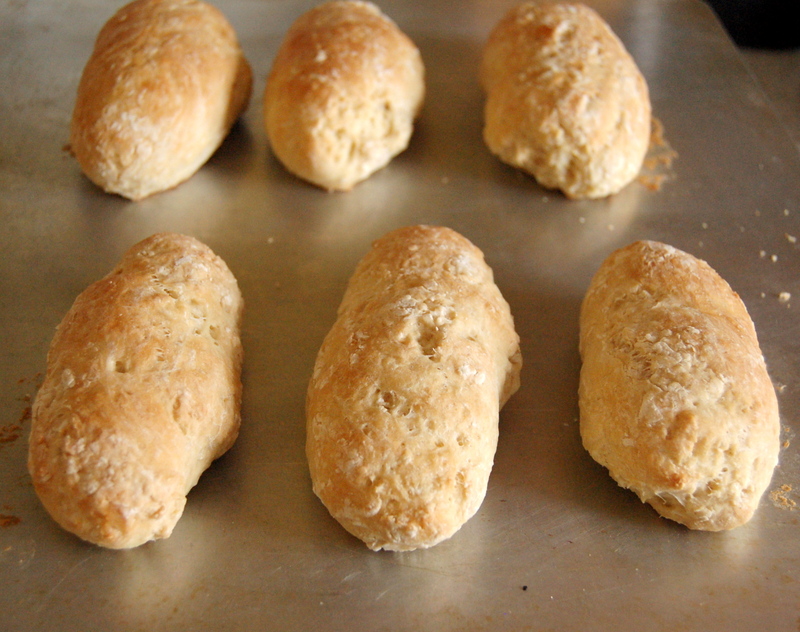 The first half I made in to a loaf and the second half I made six hot dog rolls out of, although eight rolls would have been better. Whatever you choose to make, let it rise until it doubles again. Then cook at 350. The rolls took about 20 minutes and the loaf took about 45 minutes, though my oven usually takes longer to cook than the recipe says. Voila!! The best bread ever. We all love yogurt in my house, but it can get pretty expensive to get quality yogurt that is not loaded down with sugar. This is why we decided to start making our own. It is actually a very simple process that can be done in a variety of ways. Since this is my very first attempt, I chose to try it in a dehydrator. This way the temperature is consistent, which means there is less room for error. I also am using raw milk because I believe that there is far more good nutrients in raw milk. The first step to make yogurt is to scald the milk. Normally you would boil the milk for this step, but in order to retain the properties of the raw milk, I heated the milk to 110 degrees. The next step is to add the culture. For this step I used store bought yogurt that had live active cultures in it. You have to make sure that yogurt has these live and active cultures. If not, you will not get yogurt because there is no culture to grow in the milk which is how you get yogurt. The specific yogurt I used for the culture said right on the package with the ingredients that it included live active cultures. I used half a gallon of the warmed milk and two tablespoons of yogurt and whisked them together well. Next, I put the warm milk with culture into glass jars. I used peanut butter jars that I had saved, mason jars also work well. I then set the dehydrator to 105 degrees for ten hours. When I put the jars in the dehydrator, I made sure that they were well spaced out so that the air flow would be even throughout. That is all there is to it. I put mine in the fridge over night to have it nice and cold in the morning. There was a layer of cream on the top of the yogurt that apparently happens when you use raw milk. I just mixed it in. There is also whey in to yogurt. You can strain this out with a cheesecloth for thicker yogurt or mix it in for thinner yogurt. I mixed it in, but I wish I hadn’t. Either way it was delicious, even the toddler thought so! Now that your fruit and water mixture has been sitting for 7-10 days, its time to strain it and add honey and yeast nutrient. I take a large bucket and put a strainer across the top. 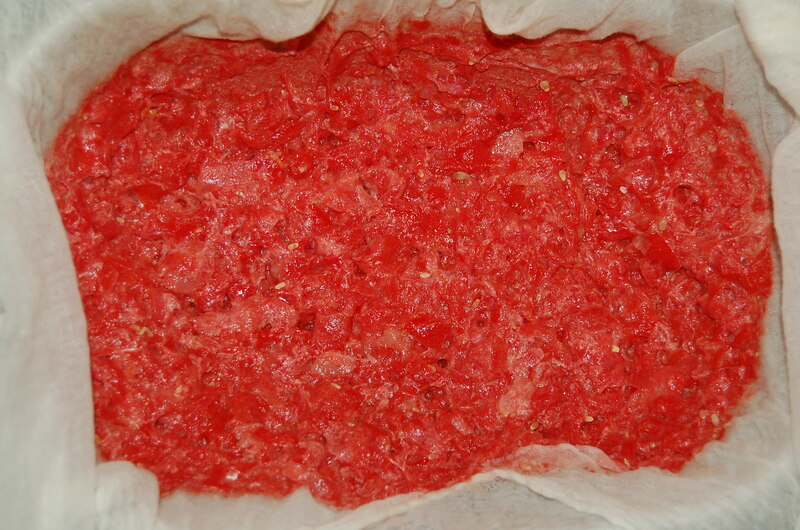 Then I put a piece of cheesecloth over the strainer so that all the little pieces get strained out of the liquid. Once I dump all the liquid through the strainer, I let it sit for a couple hours to be sure that all the juice gets out of the pulp. Next I add the honey. The recipe calls for 3 lbs of honey per gallon of the final amount of mead. Since this is going to be a 1 gallon batch, I would use 3 lbs of honey. This ratio makes pretty strong alcohol with apples. I have yet to actually measure the alcohol content of my mead, but it is obviously quite potent. I like to add the honey when it is slightly warm so that it blends in well. It shouldn’t be hot because it will kill the yeast. The next thing you add is the yeast nutrient. The kind I have says to add 1/2 teaspoon per gallon, but a different kind may vary in amount needed. Mix this all up really well and put the lid on the bucket with the airlock in place. At this point you do not want any bacteria getting into your mead because you could end up with vinegar. Let this mixture sit in the bucket for another 7-10 days and stay tuned for the next step! Buying your own adult beverages can be expensive and they are generally full of extra stuff that may not be all that good for you. Just like anything else you buy in the store. I looked in to many different options as to what I might want to make and I have found that the easiest seems to be making mead. This is my third year making it and I have yet to have a batch fail me. I am having plenty of fun altering recipes and trying different fruits. Almost all of the different varieties have been delicious. I am going to show you the very basic recipe that I use to make delicious fruit mead or country wine or whatever you might like to call it. This should be everything that you need for the entire process. I am just going to discuss the first step today as I start my own batch and follow up with the other steps when I do them for my mead. First clean your large bucket really well so that you would eat out of it. I don’t sterilize mine, but some people do. The bucket should be about one gallon larger than your carboy. It doesn’t have to be, but I found that it is less messy this way. 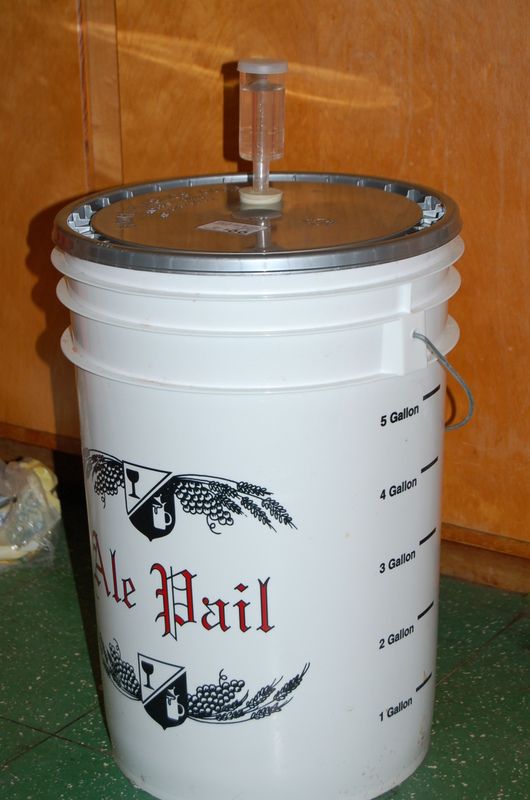 Add about 3 pounds of fruit to the bucket per gallon of mead you want. Strong tasting fruit does not require as much and mellow fruit may require more. Mash it really well. 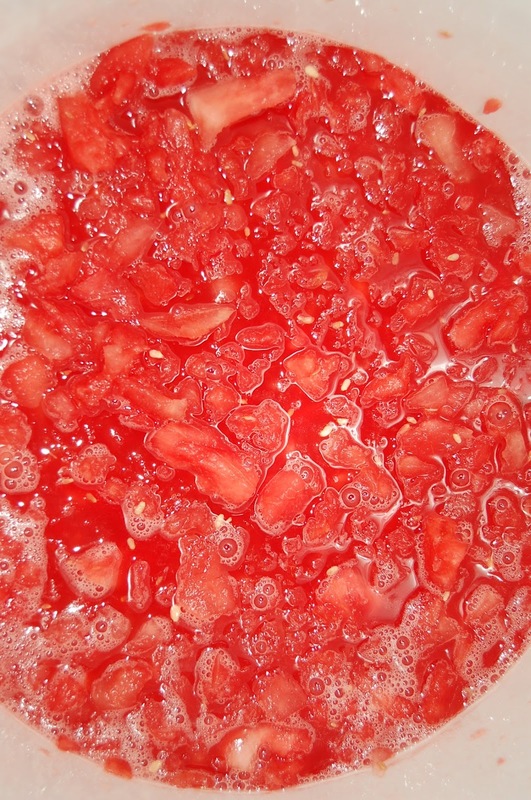 The picture is my mashed up watermelon in the bucket. Add boiling water to cover the fruit. You want plenty to keep the fruit covered but not so much that the bucket is full. It will overflow once the fermentation starts and there will be a large mess and many fruit flies. I know this from experience. You also want a little less than will fill your carboy for the same reason. You can add more water as we go. Once the water cools to room temperature, add the yeast. Too hot and the yeast will just die. Too cold and they won’t be as active. Then we wait about a week. The specific recipe that I am trying right now is as follows: 3 pounds of apple peels and cores. I have not yet tried using just scraps to make mead, but we will see how it works. I added a gallon of boiling water. Later tonight once the water cools I will add one packet of montrachet yeast and mix it up really well. Most likely next Sunday I will go on with step 2.